When you see Santa waving from his minivan in the West Vancouver Community Day Parade on a sunny day in June, you may do a double-take, but you won’t be able to stop smiling. Hank Brennan is known as “Santa Hank” to the people he helps and this year will mark the 10th anniversary of his inspired project, “Hank’s Christmas Glitter.” His mission is to break the cycle of poverty and homelessness on the North Shore and over the past decade, Hank has collected recycled cans and bottles from hundreds of North and West Vancouver families to support his mission. Hank has clocked thousands of kilometres on his festive van, which is wrapped with Christmas décor and snowflakes. 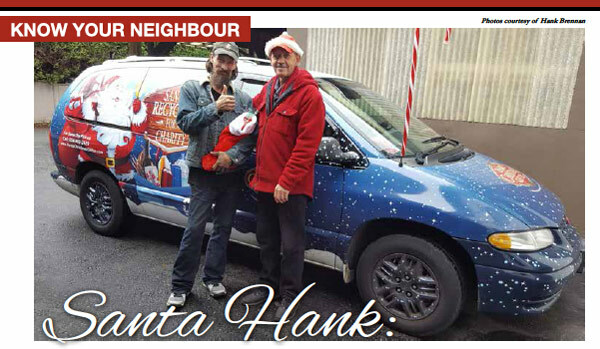 His van may be familiar to you if you’ve seen Hank driving around Dundarave picking up Santa-like sacks of recyclables. Hank is extremely grateful for the volunteers who have donated countless hours of their time to collect and sort recyclables with him. 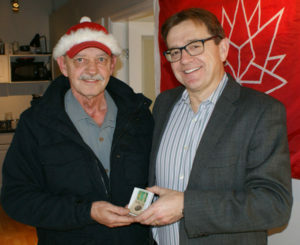 Thousands of gift cards have been handed out to homeless individuals and needy families over the years, which speaks volumes about his dedication. When you meet Hank, he has a kind face and a sparkle in his eye. 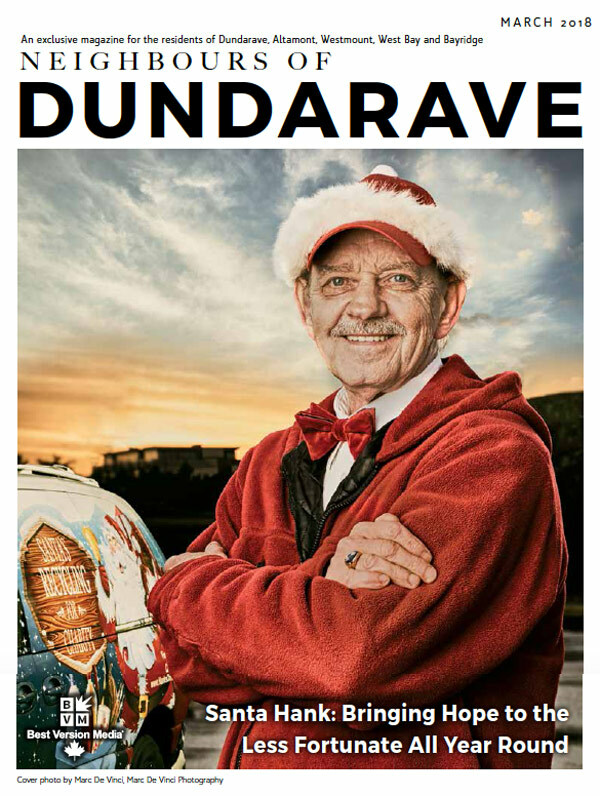 You can’t help but want to learn more about him and how “Hank’s Christmas Glitter” came to be. Born in Cornwall, Ontario, Hank was one of seven siblings and he remembers his childhood being active and happy. He was the first in his family to learn to play guitar and at the early age of 11, auditioned to sing and play at CHCH TV in Hamilton, Ontario. On Easter Sunday 1963, the whole family watched and listened to Hank as he appeared on Channel 11 on a show called “Tiny Talent Time.” In 1973 Hank was asked to join his first band and for the next few years he toured across Canada with various entertainers. In 1980, Hank met his wife Mel in Toronto. At the time, he was playing bass in a country and western band, backing Canadian singer/songwriter Harry Hibbs. Mel was there with her friends and Hank was invited to join their table on a break. Hank and Mel connected right away and were married 10 years later. They’re proud to say that they’ve been together for 37 happy years. Throughout the 80s, Hank owned and operated a small printing company in Milton, Ontario and it was a business he thoroughly enjoyed until they got word of Mel’s ailing parents in Newfoundland. Together they decided that a seniors’ home was not an option for Mel’s parents, so they packed up and started a new life in Newfoundland. While Mel spent a majority of her time supporting her parents, Hank searched for something to occupy his days. He decided to start a consignment store/flea market which was a new concept in the area and it turned out to be very well received by the community. Ultimately, the time came when Mel’s parents needed the care that Mel and Hank couldn’t provide, so they made the decision to move them into a seniors’ care facility. They left Newfoundland in the winter of 1994 and travelled extensively throughout Canada and the United States. Hank says, “We arrived in North Vancouver in January 1995 and decided to call it home. Since then, we haven’t looked back.” Hank began working as a house painter, which was very physically demanding, and the days were extremely long. In 2004, he traded his paint brushes in for Sony’s first HD semi-pro video camera and started filming weddings and special events, including live theatre. Hank had a computer built for him so that he could edit and produce videos. “This was my new passion and it continues to be a passion today,” says Hank. 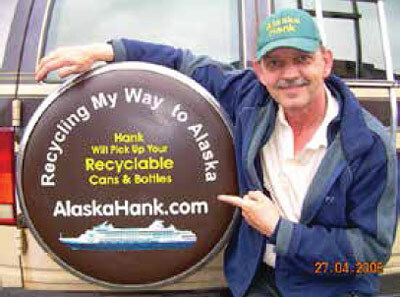 In 2006 Hank came up with a fun idea to save their refundable bottles and cans with the goal of going on an Alaskan cruise. He asked some family and friends to donate their recyclables as well in the hopes of one day making enough money to see Alaska. A website was built and word spread – soon the requests started to pour in from people who wanted to help make Hank’s dream a reality. He told all of his contributors that he would continue to collect their bottles and cans indefinitely. A logo was created, a website was developed and the media continued to follow Hank and promote his philanthropic venture. “Santa Hank” was on a mission to do something meaningful to help others. If you’d like to support Hank and his heartfelt project, it’s easy to do. Just put your bottles and cans in a bag or box and call or text Hank at 604-908- 2489 to arrange a free pickup, at your convenience. Hank will pick up anywhere on the North Shore and he’s hoping to grow his number of contributors in Dundarave. You can also visit HanksChristmasGlitter.com and fill out an online pickup request form. While you’re there, take a look at the many articles and videos that have been produced and learn more about this amazing man. The videos will bring a tear to your eye. 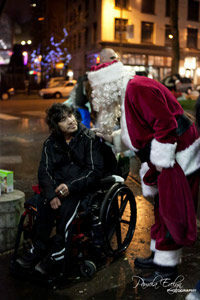 Santa Hank is a person in our community who deserves to be supported and celebrated. Be sure to attend the 2018 West Vancouver Community Day Parade to see Santa Hank arrive from his North Pole workshop (aka: his garage) just in time to drive his recycling van and join the parade. Be sure to wave as he passes by because you’ll only see him for a few short moments. 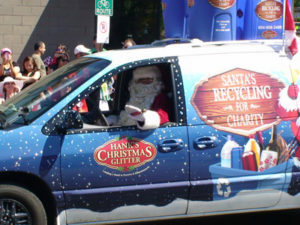 When the parade is over, Santa Hank will head back to his workshop to make sure his elves are hard at work, helping to convert recyclables to gift cards so that every day can be Christmas for some needy folks. So the next time you see Santa Hank driving through Dundarave, rest assured that Christmas has indeed come early for some. The rumour is that he’s really a guardian angel in disguise, dedicated to helping people on the North Shore – one can at a time.